Happy Friday, everyone! 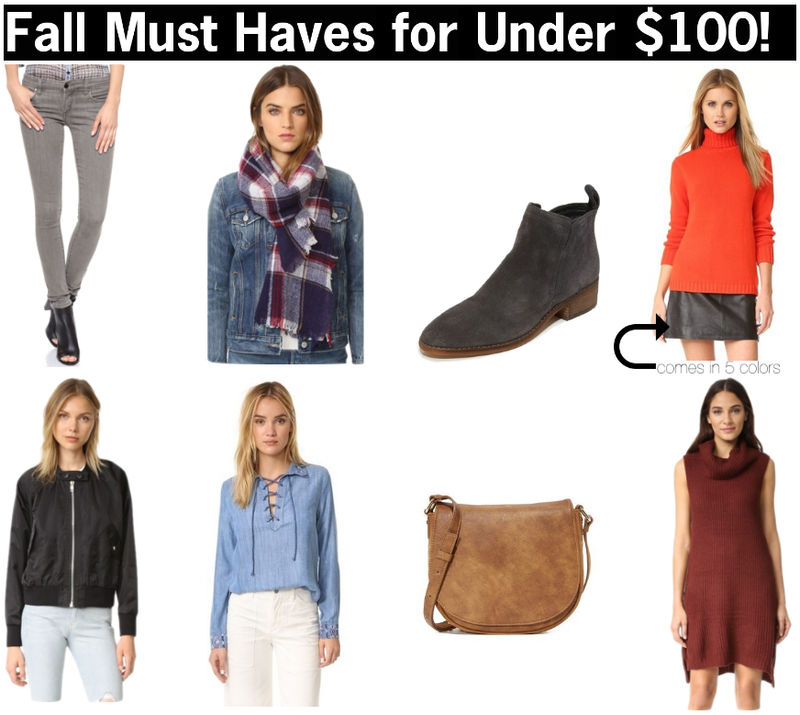 I'm popping in to talk about some fall fashion must haves that are all currently under $100. Everything in the graphic above is on sale for less than $100 until 11:59 PM tonight. However, I have linked similar pieces from other retailers in the widgets below in case you are viewing this post after the sale lends. Each item in the widget is less than $100 as well. 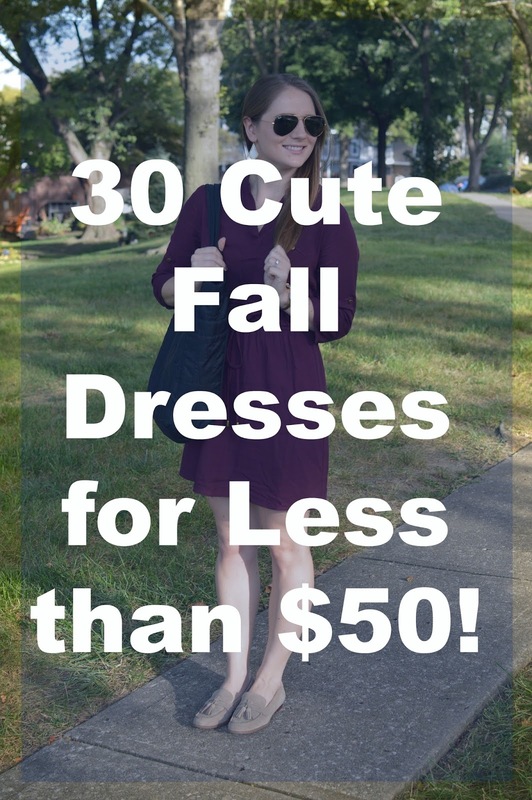 If you are looking for more cute inexpensive clothes for fall, check out this post where I highlighted 30 cute fall dresses for less than $50 each! Linking up with Meet at the Barre. I also picked up these loafers recently and let me just say I am obsessed!! I have been looking for a pair of loafers for awhile now. I wanted an option for a shoe to wear to work that had more support than a ballet flat but also wasn't a boot. Sometimes it's just too hot to throw booties or boots on, haha. These are perfect and I absolutely love the tassels on them! I sized down 1/2 a size in these and they fit great. They were a little tight to begin with, but I wore them around the house for about 30-40 minutes and they fit great. Just something to keep in mind if you are ordering them! P.S. 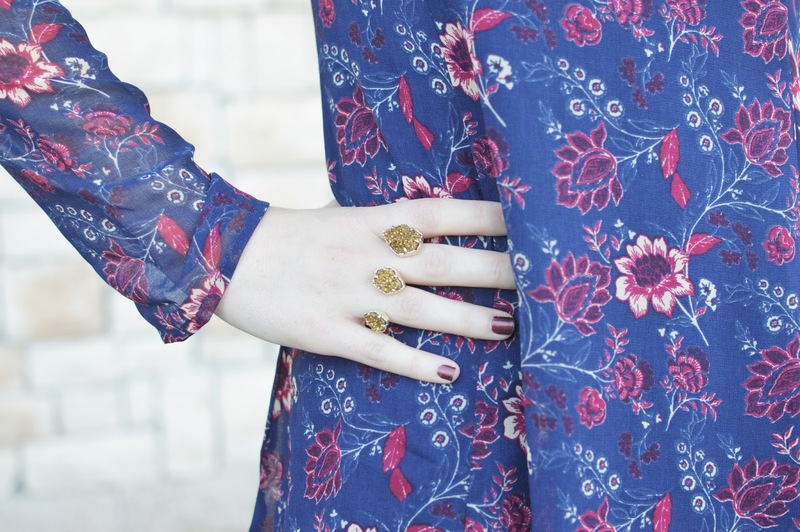 They also come in navy and I think they are so pretty! 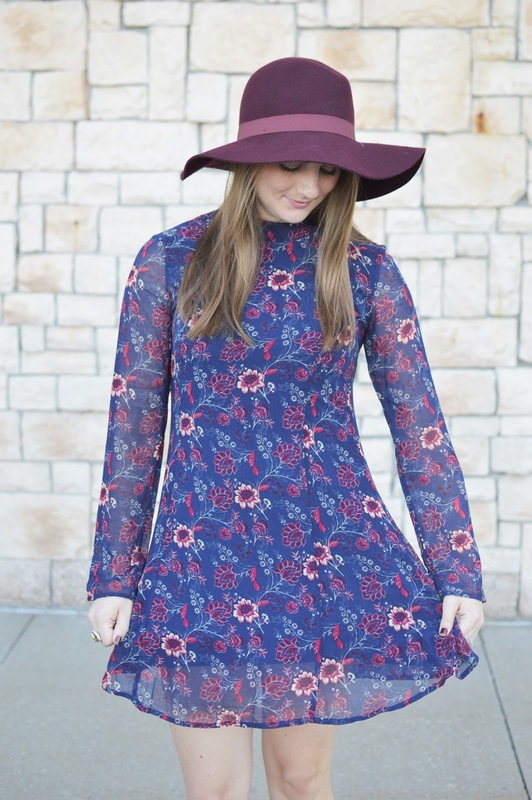 Do you all remember this dress from this summer? 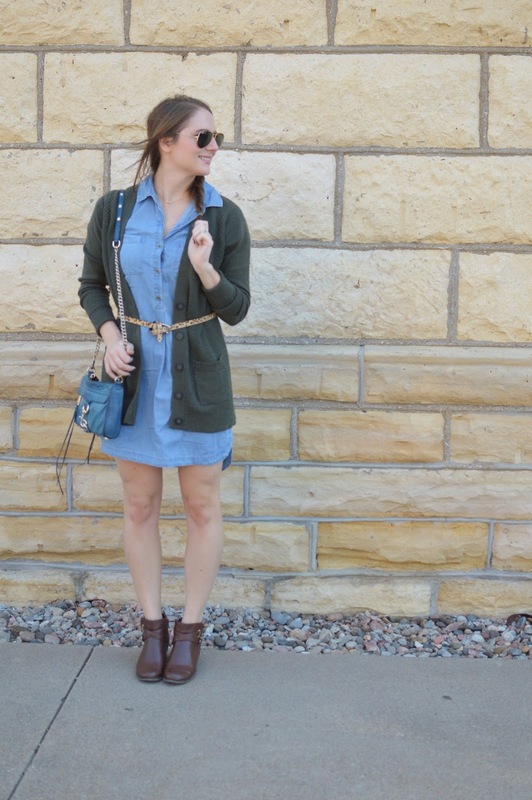 This chambray dress is the perfect transition piece between seasons. 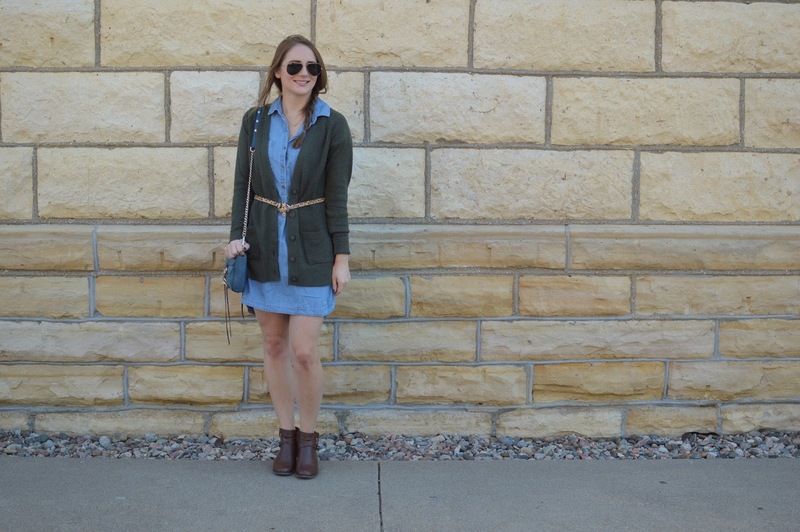 I love it layered with a sweater for a little extra warmth to make it fall appropriate. To give myself a little more shape, as this is a looser fitting sweater, I belted the sweater with a leopard belt. 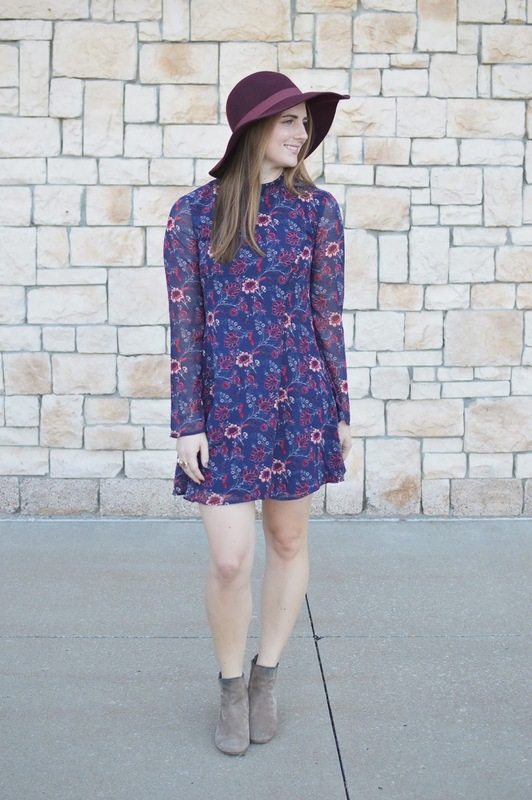 It is the perfect touch to this outfit! 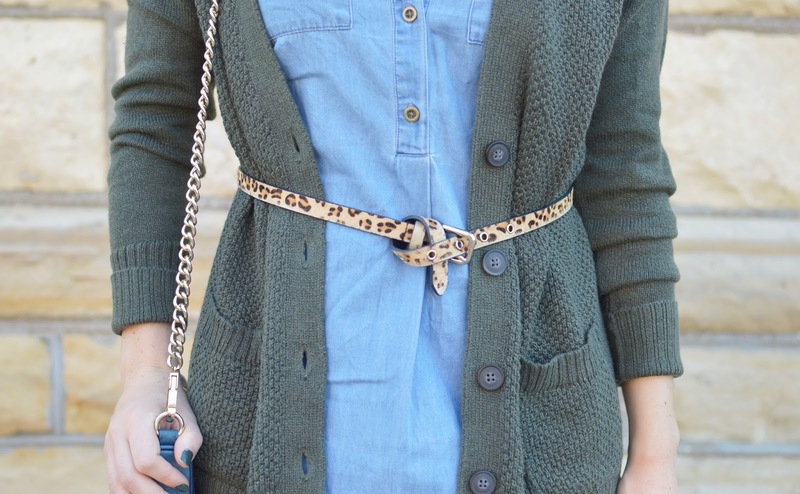 I love how the belt incorporates a pattern into an otherwise simple outfit. I really like tying my belts in a knot over dresses as a way to help give shape to looser fitting dresses. 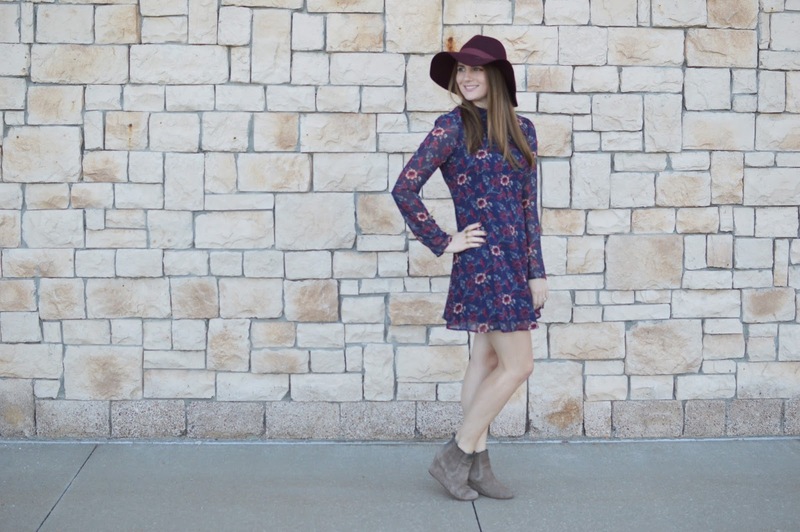 Check out this post for a recent example of this idea or this post for a big throwback! Also, if you have had your eyes on a Mini M.A.C. 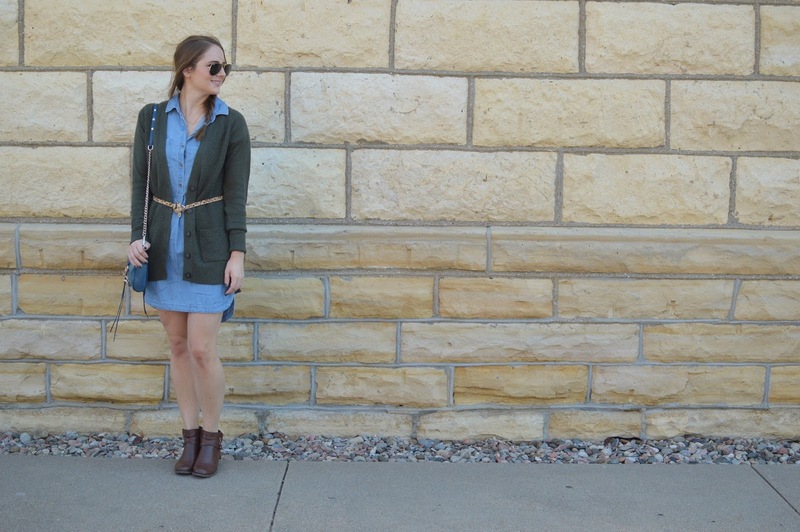 Crossbody, this color is currently on sale! 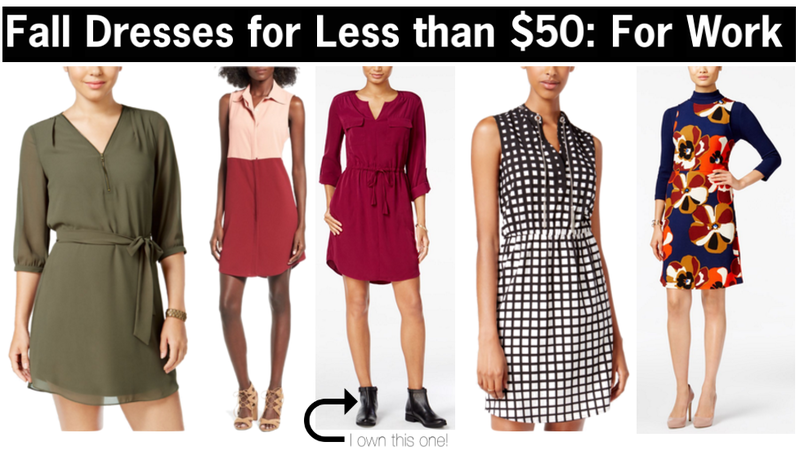 You can save $80! Shop it here. 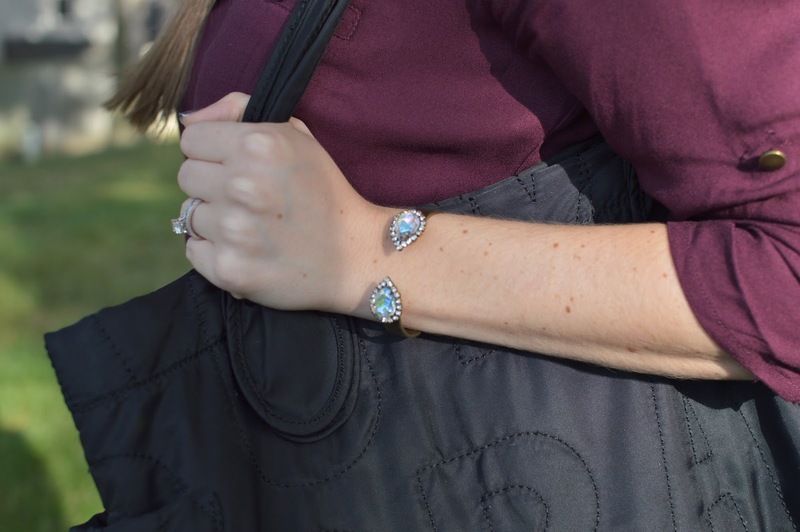 Linking up with B Loved Boston and More Pieces of Me. Happy Friday everyone! Anyone have big plans this weekend? I am going to the Keith Urban concert with my mom and sister. It's a tradition.. we've seen him at least 5 times together! I am so excited. My nephew is also getting baptized on Sunday, so it will be a very fun weekend. I had a lot of positive comments about my post on Monday. 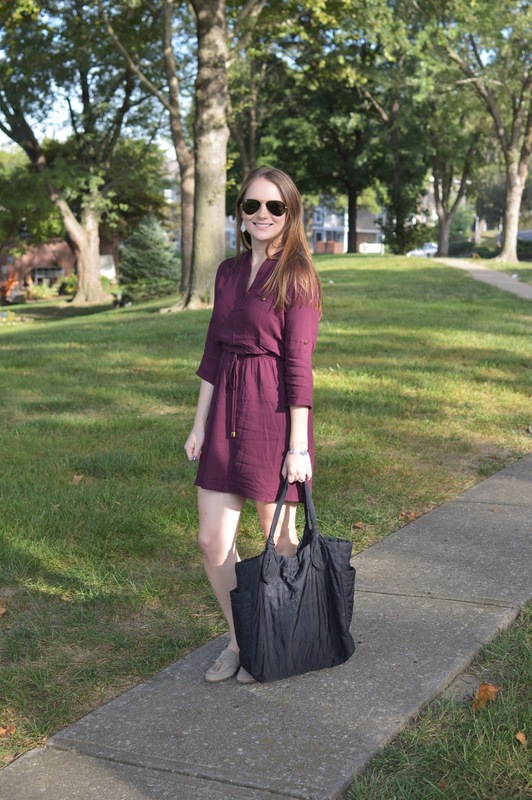 Thank you all for your kind words about my blogging hiatus! 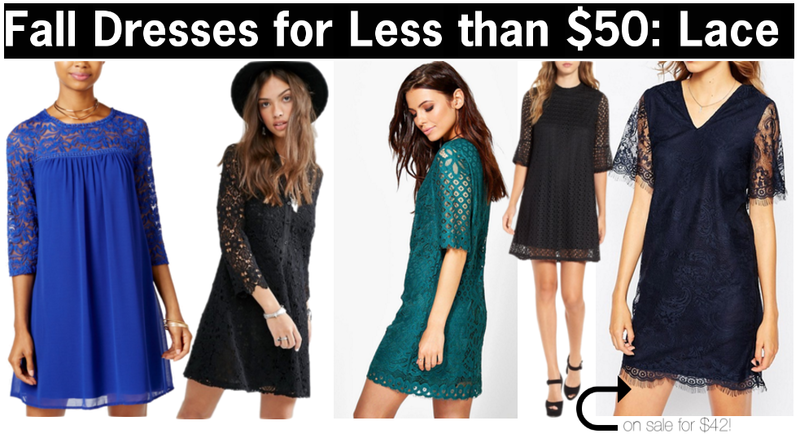 As I was writing that post, I found out that the dress I was wearing was on sale for less than $50. 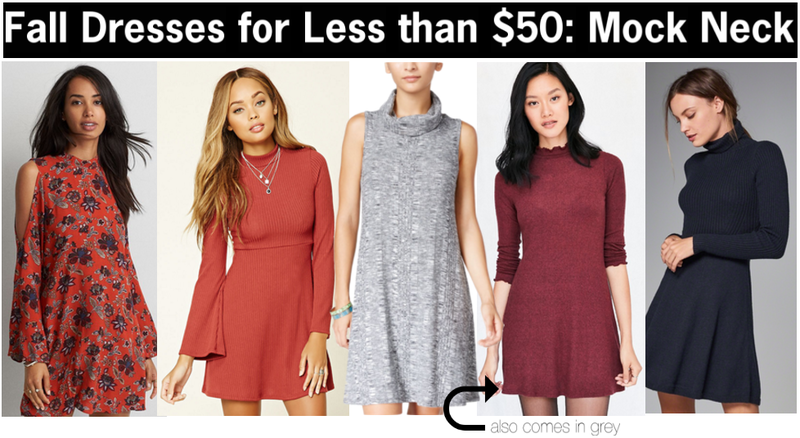 It inspired me to write a whole post dedicated to showcasing cute fall dresses for less than $50. 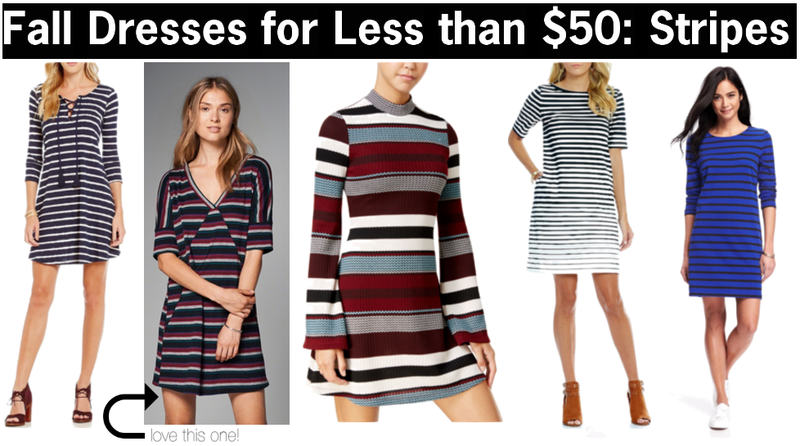 There are so many cute dresses for fall and you don't have to break the bank in order to add one (or many!) to your closet. Below are some of my favorites! 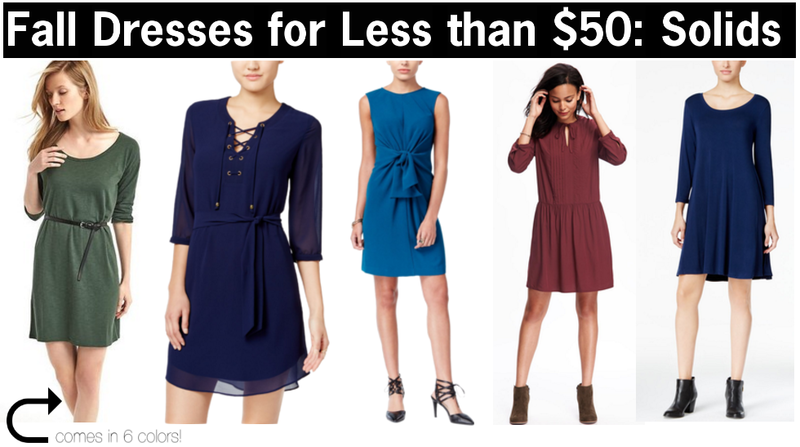 I broke them out into different categories to make it easier to shop. Let me know if you like this style of post in the comments. It was really fun to put this post together, so I think it could be a fun thing to start doing each season if you all like it! 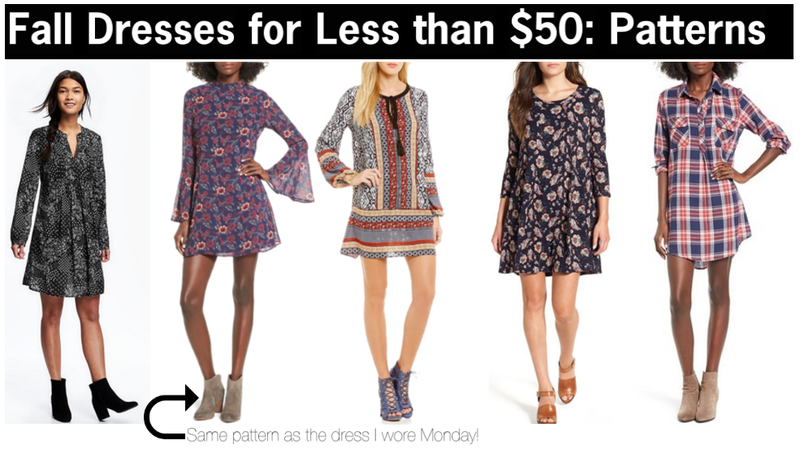 Let me know which dress, or which "section", is your favorite in the comments! Have a good weekend! I don't know about you, but I view every fall as a chance to lay out new goals or plans for the rest of the year. The back to school season seems like the perfect time to set some new "new year's resolutions". For some reason, this time of year has always felt this way for me. You've got just a few months left to meet your goals for 2016! (Crazy, right?!) The 5 tasks below are all things I've started doing recently and have made such a positive impact on my day to day life. During the summer, I decided I wanted to start trying to kick my caffeine/coffee addiction. I drank it every day, whether I really needed the energy boost or not. I wanted it to start actually help to increase my energy so I cut back on it. I adopted the strategy of hydrate before you caffeinate. This is not a new message, as there are many articles written on it already. Water fires up your metabolism, flushes out toxins, and ultimately hydrates you. Most of the time, when I drink water first, I find I don't even need or want the coffee anymore. (And it makes the coffee I do drink that much more satisfying!) Even without the caffeine from coffee, I find I am energized just from the water. Give it a try sometime! If you don't think you can skip coffee first thing, try just drinking a glass of water at the same time. One thing my insurance does, is let us earn points for healthy habits that go towards HRA or HSA funding. We can earn points for logging daily work outs or getting a flu shot, for example. At a recent doctor's appointment, my doctor said one thing I could do if I wanted to earn more points was start taking vitamins. I always try to maximize the points I earn, so I pretty much immediately went to Walmart to pick some out. I was drawn to the Sundown Naturals® brand, as they have so many different varieties to choose from. I knew I wanted a gummy vitamin for taste and their selection did not disappoint. One thing I don't get enough of in my diet is calcium. I cannot drink regular milk, so while there are many sources of calcium I know I don't get the recommended amount. I picked up these calcium gummies from Sundown Naturals® to help me get more calcium (and to earn more points)! They are super delicious, too. Sundown Naturals® are free of gluten, diary, and artificial flavors◊. You can find Sundown Naturals® at WalMart (they have a huge selection and it's THE PLACE to find them)! Sundown Naturals® is currently hosting a Goodness Giveaway Sweepstakes. Head to your local Walmart and purchase at least 1 Sundown Naturals® vitamin product for a chance to win weekly prize packages and a grand prize! Every week, one winner will be selected to choose from 1 of 4 prize packs - Yogi Pack, Fitness Pack, Foodie Pack, or a $100 WalMart Gift Card. Simply upload a picture of your receipt here and you are entered for a chance to win some incredible prizes now through 11/1! This has been a new year's resolution for me for probably 2 years and counting. I feel like it's something we can always get better at. I work at a desk job so I am on my computer all day. The last thing I want to do is get home from work and then stare at a computer screen for three more hours, watch TV all night, or play on my phone. It's very easy during the summer to step away from the screen as Tyler and I love to be active and do things outside, like go for a walk on the neighborhood trail. It's a little more difficult once it cools down. I think it's important to find a hobby that doesn't involve a screen. Two of my favorites are reading or playing the piano. Eventually during the evening, I do turn to a screen of some sort. (I can't resist a few episodes of Modern Family at night!) Let's be honest, it'd be pretty hard to avoid a screen for all hours of the day. Try to find some new activity you can do for a few hours, at least! My office recently got remodeled and one thing that was added was plenty of standing desks. I love it! I try to take at least one meeting from a standing desk a day. It makes such a huge difference in my energy if I get up and stand for an hour or two during the middle of the day. Also, I find that I don't feel nearly as lazy if I stand for a few hours a day. Does anyone else feel like a huge lazy pile if they just sit all day haha!? If you can't work at a standing desk, check your posture throughout the day. Another thing you could add to your daily schedule is a walk around the office. During the warmer months quite a few people where I work will take a walk to the end of the parking lot and back. It feels good to get up and get moving throughout the day! While most of these other tasks all relate to something physical, this one relates more to a mental improvement. I read a quote on Pinterest once that said "What if you woke up today with only the things you thanked God for yesterday?" It really stuck with me. I feel like it can be applied so many ways. Whether that is thanking someone for holding the door open for you, writing a hand written thank you note for someone who did something nice, or praying about it, I truly think it pays off to show gratitude. In a time when it can be hard to find someone with manners, be that person. One thing I always try to do is write hand written thank you notes, and I have received positive comments about it often! This is not a common thing to do, besides for a big event like a wedding, so people really take notice if you do. If someone writes me a thank you for something I did, it makes me want to continue doing nice things for them because I know they appreciated it! Give thanks where it is due, and I really think it will improve your day (and the person on the receiving side)! 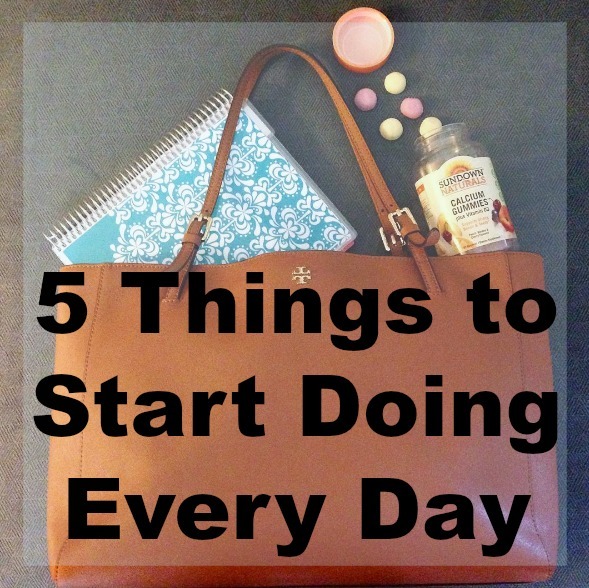 These are the five things I have started doing every day. They have all had a positive impact on my daily life. Anything you think I missed? Let me know in the comments! These statements have not been evaluated by the Food and Drug Administration. These products are not intended to diagnose, treat, cure or prevent any disease. ◊Applies to all products manufactured after 5/1/15. Please check back of label as manufacture dates may vary. Hello again, blogging world! It's been awhile (over 6 weeks to be semi-exact) since my last blog post. I have never been gone that long at one time before. Thank you all for sticking with me through the past few weeks of silence. A special thank you to those of you who reached out through email during my absence to make sure nothing horrible had happened or just to say hi. 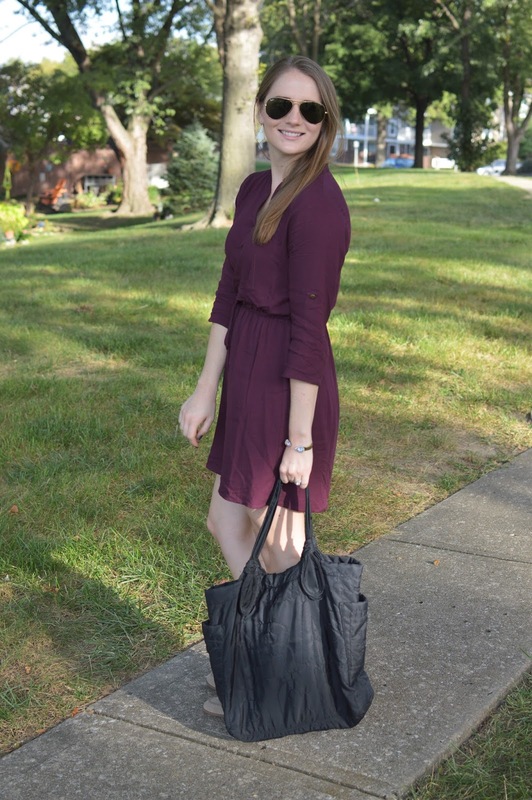 The people I have met through blogging are truly incredible! I could go through a huge list of reasons of why I have been gone, but I don't want to bore you with them all so I will do my best to keep this brief. I will say it all started with a lack of interest in Instagram. If you follow me there, you most likely noticed I pretty much abandoned my Instagram account way back in June. I have always been more interested in my actual blog than my Instagram. I like writing and I like that I own my blog. With the algorithm change, bloggers, influencers, and regular users now only see what Instagram wants to show you. I don't know about you, but I see the same 15 people over and over again. Even if I don't interact with their photos, they keep coming up. I can go through the number 1 account I want to see on Instagram and like every single one of their photos and they still don't appear in my feed. It's so annoying! So not only have I not been posting, I basically just stopped logging in all together. Instagram has even emailed me saying things like, "Don't forget about your account!" I am trying to get back into it now, but we shall see what happens there haha. 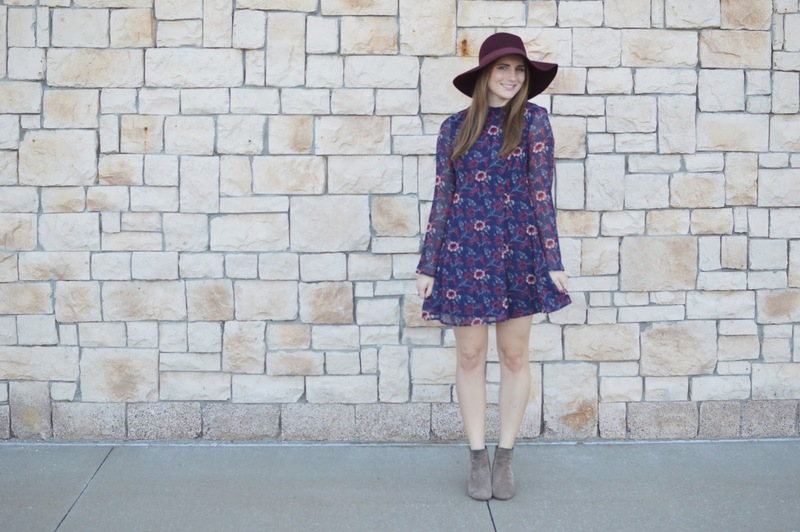 Despite my lack of interest in Instagram, I still loved blogging. However, life got very busy at the end of August/beginning of September. We had a lake vacation, a trip to Omaha to visit family, I was out of town for work for a full week, and Tyler was also out of town for work a separate week. All in all, the blog was placed on the back burner. Once it was there, I found it hard to take it off the back burner. At first it was really weird to not blog, but then it just became the new normal. Over the past few weeks, there were many times that I wanted to bring the blog back. For example, I'd want to log in and share a sale guide with all my picks from an awesome sale. However, I didn't think it was really fair to not post for 2 weeks, write 1 post about my top picks from the Loft sale, and then not post again for another 2 weeks. Or, Tyler and I would be driving around town and I'd find a great spot to take blog pictures, but we wouldn't have the camera so we'd keep driving. These kinds of things happened often enough that I decided to bring the blog back. 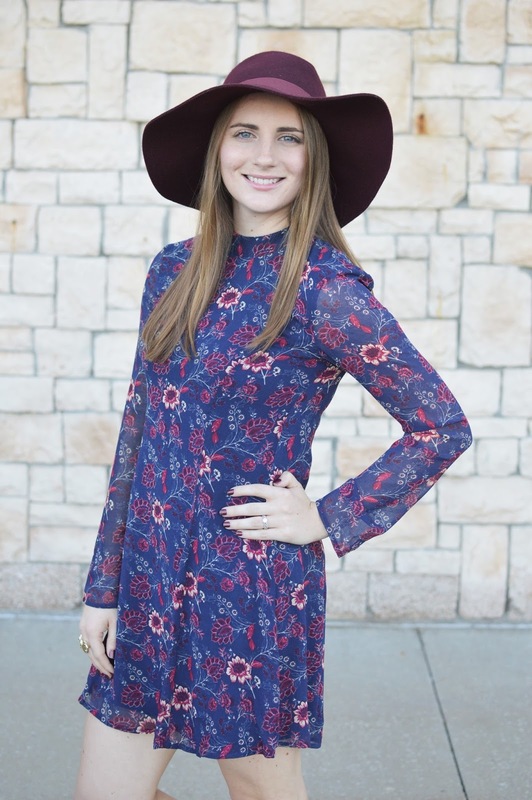 I am not really sure where the blog will go from here, but I am happy that it is back today! I love having this little piece of the internet as a creative hobby. Also, I love having some place where I can talk about fashion, makeup, or traveling with other people who have the same interests. Tyler is a great sport and will listen to me be excited about new shoes but he doesn't have the same appreciation as some of you haha. I am looking forward to connecting with you all again and thanks for your support while I was gone!